January 25, 2016 – In this episode, we’ll be boarding a Pullman car attached to one of the great trains connecting the North American east and west coasts, all the way up into the Alaskan and Yukon territories — and very nearly across the Bering Strait to Siberia. 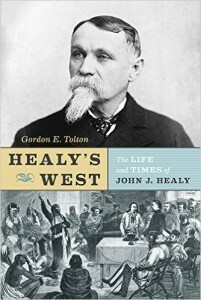 Our conductor on this journey is Gordon E. Tolton, author of Healy’s West: The Life and Times of John J. Healy . Gordon is a Western Canadian historic interpreter and author of the previous books, The Cowboy Cavalry, and Prairie Warships. You can join his Facebook group, Ranger Gord’s Publications, for discussions of Western Canada’s history and some self-described goofball humor. Follow him guest on Twitter @RMRanger, and check out his blog: RangerGordsRoundup.Wordpress.com.